In Japan: Authorities Rush To Recover Bodies In Evacuation Zone : The Two-Way Wearing protective clothing because of radioactivity in the area, hundreds of police officers are searching for thousands of missing persons. They're hoping to recover bodies before they completely decompose. 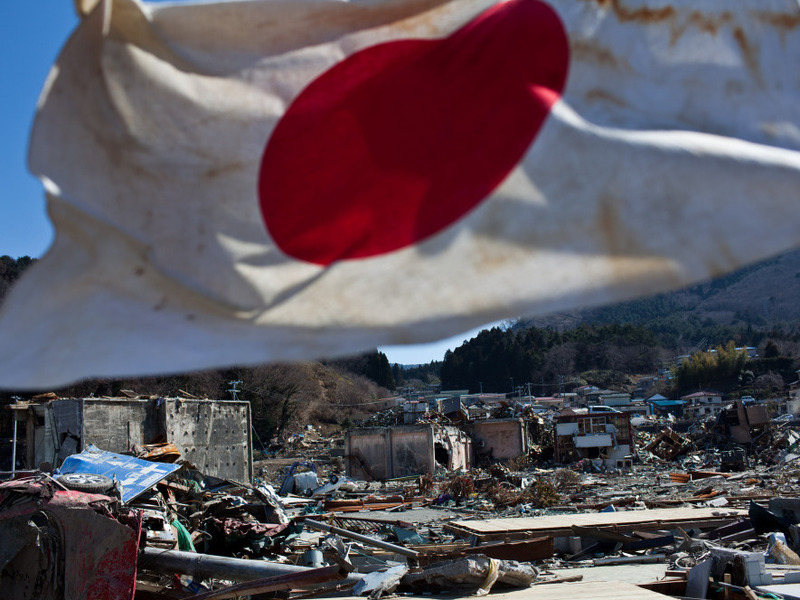 A Japanese flag waved Wednesday over the the wreckage and devastation in Onagawa, Miyagi prefecture. "Japanese police raced Thursday to find thousands of missing bodies before they completely decompose along a stretch of tsunami-pummeled coast that has been largely off-limits because of a radiation-leaking nuclear plant," The Associated Press writes from Minami Soma, Japan. NHK says that "nearly 300 police in protective clothing have searched for people missing after the March 11th quake and tsunami within the 20-kilometer evacuation zone around the troubled Fukushima Daiichi nuclear power plant. The operation began on Thursday afternoon, when about 240 officers from Tokyo joined about 50 Fukushima police, whose efforts there have been hampered due to fears of radiation." More than 27,600 people are dead or missing. Meanwhile, Kyodo News reports that "An operation to reduce the risk of a hydrogen explosion at the crisis-hit Fukushima Dai-Ichi atomic power station's No. 1 reactor by injecting it with nitrogen has gone smoothly, the plant's operator Tokyo Electric Power Co. said Thursday. On Morning Edition, NPR's Jon Hamilton reported about how some soil "turned soft" after the massive earthquake on March 11 (which caused the tsunami that devastated much of the country's North Central coast and crippled the Fukushima Dai-Ichi power plant). And NPR's Christopher Joyce reported about how the disaster in Fukushima has put a renewed focus on how to handle spent nuclear fuel in the U.S.